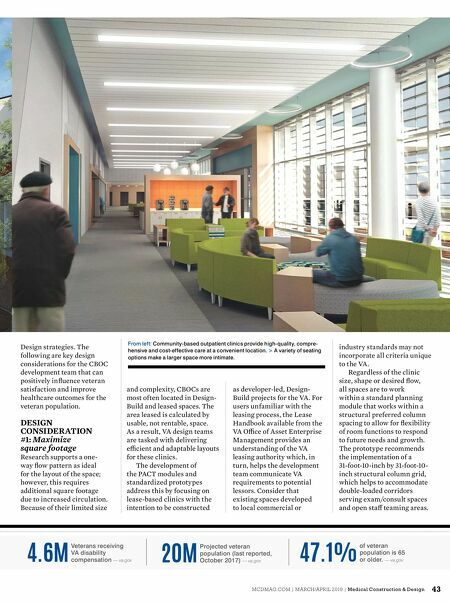 MCDM AG.COM | M A RCH /A PR IL 2018 | Medical Construction & Design 43 Design strategies. 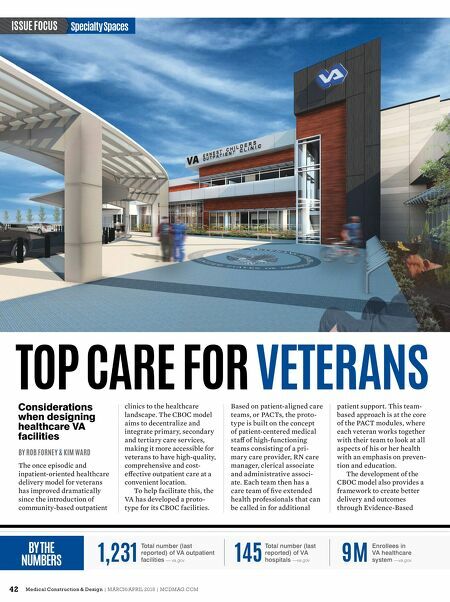 The following are key design considerations for the CBOC development team that can positively infl uence veteran satisfaction and improve healthcare outcomes for the veteran population. DESIGN CONSIDERATION #1: Maximize square footage Research supports a one- way fl ow pattern as ideal for the layout of the space; however, this requires additional square footage due to increased circulation. Because of their limited size and complexity, CBOCs are most often located in Design- Build and leased spaces. The area leased is calculated by usable, not rentable, space. As a result, VA design teams are tasked with delivering effi cient and adaptable layouts for these clinics. The development of the PACT modules and standardized prototypes address this by focusing on lease-based clinics with the intention to be constructed as developer-led, Design- Build projects for the VA. For users unfamiliar with the leasing process, the Lease Handbook available from the VA Offi ce of Asset Enterprise Management provides an understanding of the VA leasing authority which, in turn, helps the development team communicate VA requirements to potential lessors. Consider that existing spaces developed to local commercial or industry standards may not incorporate all criteria unique to the VA. Regardless of the clinic size, shape or desired fl ow, all spaces are to work within a standard planning module that works within a structural preferred column spacing to allow for fl exibility of room functions to respond to future needs and growth. The prototype recommends the implementation of a 31-foot-10-inch by 31-foot-10- inch structural column grid, which helps to accommodate double-loaded corridors serving exam/consult spaces and open staff teaming areas. 4.6M Veterans receiving VA disability compensation — va.gov 20M Projected veteran population (last reported, October 2017) — va.gov 47.1% of veteran population is 65 or older. — va.gov From left: Community-based outpatient clinics provide high-quality, compre- hensive and cost-effective care at a convenient location. > A variety of seating options make a larger space more intimate.